Last month when I heard the news that my favorite bookmarking tool, Google Notebooks, was being discontinued I panicked. I used Google Notebook all the time for everything from notes to bookmarks. And having my notes and bookmarks available to me at all times and on any computer I am using is a must. 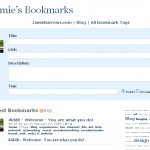 I looked around at some of the alternatives and did a little research into what I could use to replace it, but in the end I decided I needed to take control of my own bookmarks. Losing all my bookmarks and notes was not something I wanted to happen to me. And relying on a third party service was just asking for trouble. So I decided to create my own. Now anyone who knows me, knows that I am all about adapting existing systems to my needs when I build software. 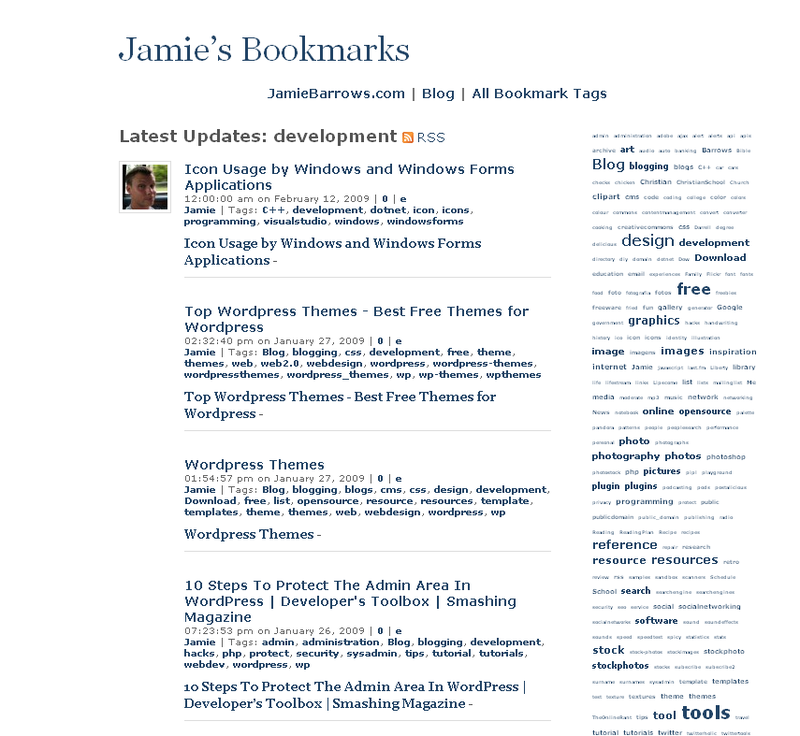 So my initial thought was build my own bookmark service using WordPress as a base. After all, this site and many others I run/administer use WordPress. So I’m pretty familiar with it. To that end, I started researching what plugins and features were already out there for WordPress that I could use. 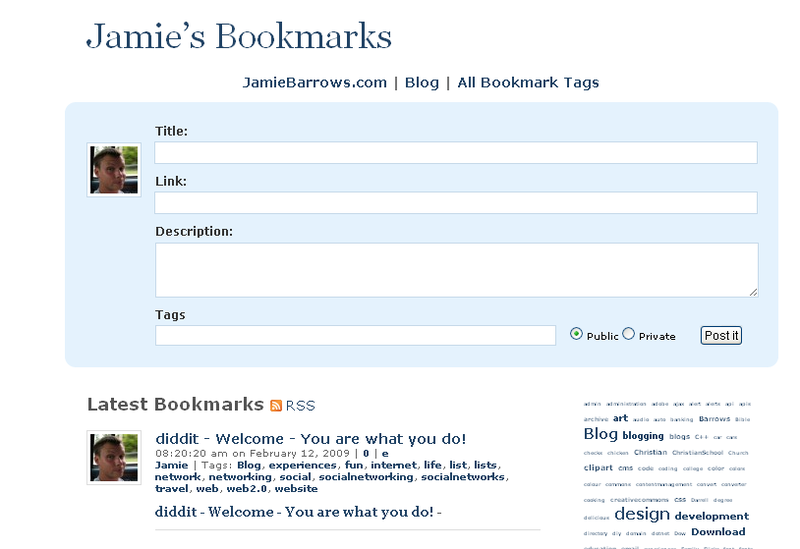 And the result was the new jamiebarrows.info site. It’s not completely perfect, and I’m still modifying it and tweaking it, but for the moment it does everything I wanted it to do. Here are the tools/plugins/themes I am using to accomplish this. WordPress.Org The underlying engine of the entire site. 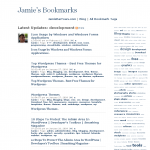 PressMark Theme A WordPress theme/conversion that is set up specifically for bookmarking. Has a great little scriptlet that you can add to your toolbar to clip and bookmark while reading or browsing. Also gives you the option of making a bookmark public or private. Postalicious plugin A WordPress plugin that automatically pulls any Delicious bookmarks along with their tags into WordPress and posts them as a WordPress post. I found that this way I can still use a third party tool to do my bookmarking without surrendering control of those bookmarks. wp-Spamfree plugin Not strictly a bookmarking plugin, but this does eliminate spam comments almost entirely. Which is important if I want my bookmarks to be open to comments. And that’s it. The whole thing was a lot easier than I expected it to be. Most of the tools I needed were already written and required little or no modification to get them working the way I wanted them. All of my bookmarks and notes are now located on a domain and in a database and form that I control. And so far it’s working out pretty well.